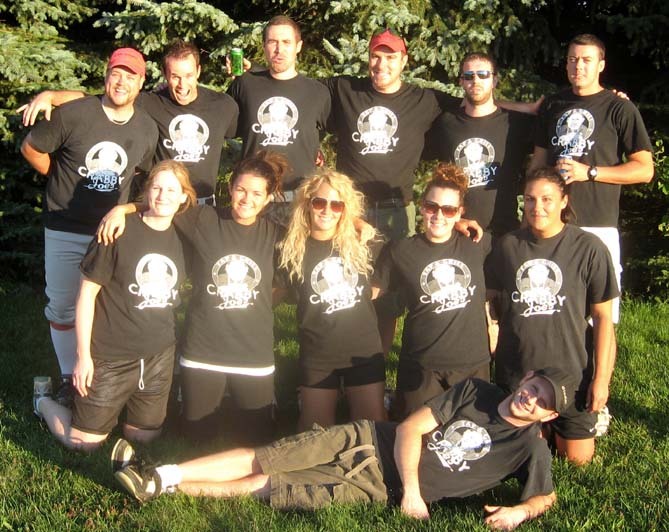 Final Score: Crabby Joe's 6 Phar From Hitting 6.In the first game of the tournament on Friday night @ McNaughton. We got down early, but staged a fantastic comeback including a 5-run 6th inning. This earned us a tie with the 1st place team. 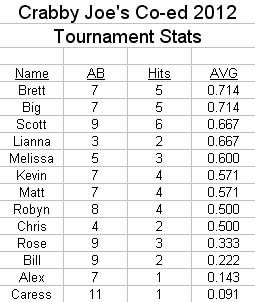 Tournament things were looking good... Offensively, Scott had 2 doubles, a single and a run scored. Kevin had a double, a single, 2 RBI and a run scored. Big had a double, a single, 1 RBI and a run scored. Chris had a double, a single and 1 RBI. Lianna had 2 singles, 1 RBI and a run scored. Brett had a double and a run scored. Matt had a single and 1 RBI. Robyn had a walk and a run scored. Bill & Rose had a single each. Brett pitched all 7 innings allowing 6 runs on 17 hits, while walking 1 and striking out 1. Final Score: Custom Tree Service 10 Crabby Joe's 5.In our first game Saturday morning we played a "revamped" team that we had beaten during the regular season. We again exploded for a 5-run 6th inning however it was too late and we fell 10-5. Offensively, Brett had a double, 2 singles, 2 RBI and a run scored. Matt had 3 singles and a run scored. Big had a double, a single and 2 RBI. Robyn had a single, 2 walks and a run scored. Melissa had 2 singles. Scott had a single, 1 RBI and a run scored. Rose had a single and a run scored. Bill & Caress had a single each. Brett pitched all 6 innings allowing 10 runs on 16 hits, while walking 3 and striking out 2. Final Score: Encore...Again 9 Crabby Joe's 4.In a critical rematch with our tournament lives on the line we were unable to put together a big inning and in the process gain another bitter league enemy. Offensively, Robyn had a triple, 2 singles, 2 RBI and a run scored. Brett had a single, a walk, 1 RBI and 2 runs scored. Scott had 2 singles and a run scored. Kevin had 2 singles. Big had a double and 1 RBI. Alex, Rose & Melissa had a single each. Brett pitched all 6 innings allowing 9 runs, while walking 2 and striking out 1.